Every Wednesday and Thursday in June. Ride lovers, this one’s for you! Enjoy unlimited Fun Zone or Kids Zone rides for one price. Wristbands go on sale May 1, 2019. 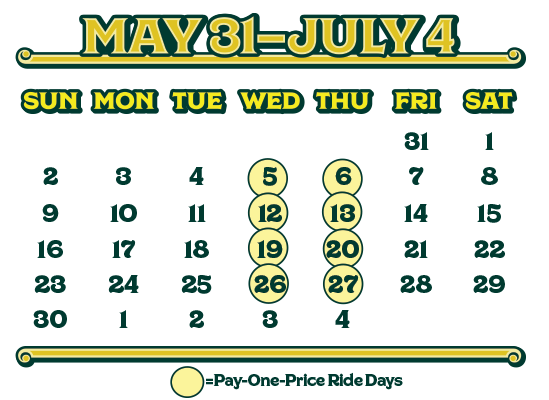 Save $10 on early Pay One Price Ride Days — Wednesday, June 5 and Thursday, June 6. This is a limited time offer, purchase now through April 30, 2019. Dates: For 2019, Pay-One-Price Days are Wednesdays and Thursdays in June. A wristband allows unlimited access to Fun Zone and Kids Zone rides on one day. Hours: Noon to 8:00PM. Wristbands must be purchased and vouchers redeemed no later than 6:00PM. How much do ride wristbands cost? Ride wristbands cost $38 and are not transferable. From April 15-30 only, wristbands purchased for use on June 5 and 6, 2019 will be sold online only with a $10 savings. Beginning in mid-May, visit any participating San Diego County 7-Eleven store for a $5.00 discount coupon with a qualifying Aquafina purchase. Coupons may be redeemed at any carnival ticket booth at the Fair or by purchasing online before May 30, 2019 (promo code required). Coupons will be available in 7-Eleven stores from mid-May through June 27, while supplies last. When and where can I buy a wristband? When: You can buy wristband vouchers online in advance, or buy wristbands at the Fair the day of the promotion. We stop selling wristbands at 6:00PM. Where: On Pay-One-Price Ride Days, buy a wristband at Fun Zone and Kids Zone ticket booths. Is the wristband valid for every ride at the Fair? A select few “thrill rides” and attractions do not honor Pay-One-Price wristbands, as payment is made directly to the ride operator. 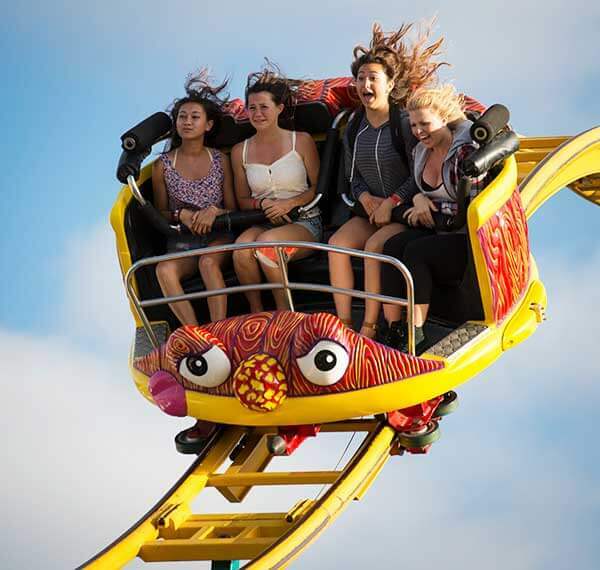 These rides include the Turbo Jump, Rock Climbing Wall, Pony Ride, Bungee Jump and Sling Shot. Persons with disabilities and persons wearing casts may not be able to ride certain rides. Pregnant women are advised not to ride. No cell phones allowed on rides. Loose shoes and sandals may not be allowed on some rides. If you experience problems while purchasing the wristband voucher, please call Admit One Customer Service at (714) 442-3874, Monday through Friday, 7:00AM-5:00PM. Purchase must be made by June 2. Purchase must be made by June 3. Purchase must be made by June 9. Purchase must be made by June 10.